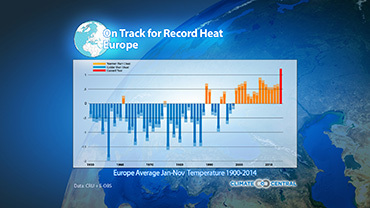 It is increasingly certain that 2014 will be the warmest year ever recorded in Europe, according to a new analysis of European temperature records dating back to the 1500s. What role did global warming play? A significant one, according to new research from three independent climate science teams from the UK, the Netherlands and Australia. 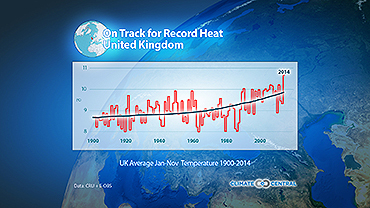 To assess the potential link between Europe's likely record-breaking hottest year and global warming, Climate Central worked with scientists from the Royal Netherlands Meteorological Institute (KNMI), the University of Oxford, the University of Melbourne and the Australian National University. The three teams conducted independent assessments, using different approaches involving statistical analyses of the historical temperature record and the results of thousands of simulations with state-of-the-art climate models. The KNMI and Melbourne teams found that the odds of average temperatures across Europe reaching this year’s record-setting levels were increased by at least 35 to 80 times due to human influence on our climate. The team at the University of Oxford found that, even on a more local scale where variability is often greater, global warming had increased the odds of a year as hot as the one just experienced in most of continental Europe by at least a factor of 10. Climate change makes hot years hotter and more common. Nine of the 10 hottest years ever recorded globally have occurred since 2000. According to NOAA’s National Climatic Data Center (NCDC) there hasn’t been an annual cold record globally since 1911. In Europe, nine of the 10 hottest years ever recorded have also all occurred since 2000. 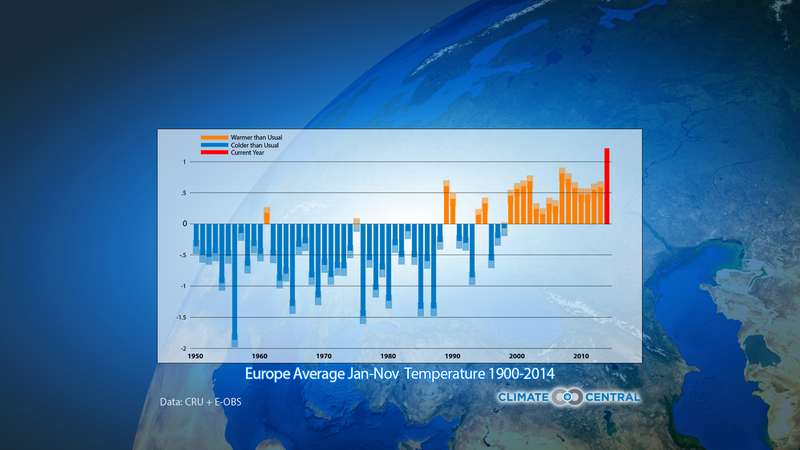 There hasn’t been an annual cold record across Europe since 1956. Using early instrumental records and proxies like tree rings to extend the temperature record for Europe back to 1500, climate scientists found that the average January-through-December temperature in Europe during 2014 was very likely warmer than at any time during the past 500 years. 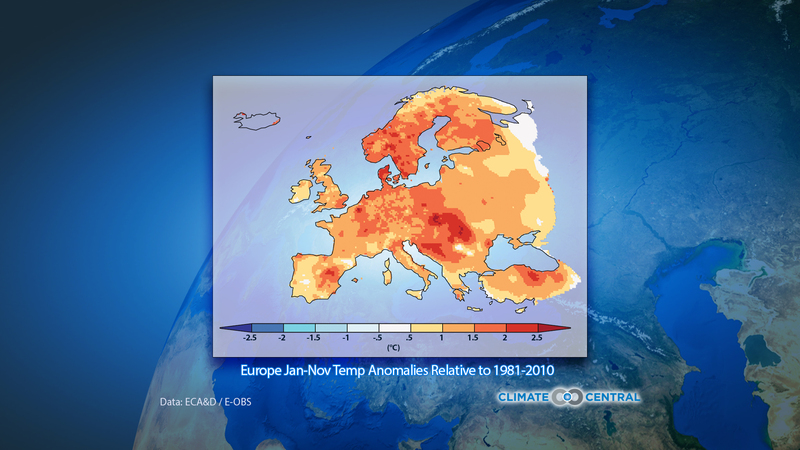 Initial estimates from KNMI forecast the January-December annual mean temperature for Europe to be 10.5ºC, or 0.3ºC above the previous record set in 2007. “In the early 1900s, before global warming played a significant role in our climate, the chances of getting a year as warm as 2014 were less than 1-in-10,000. In fact, the number is so low that we could not compute it with confidence,” Geert Jan van Oldenborgh, a climate scientist at KNMI, said. 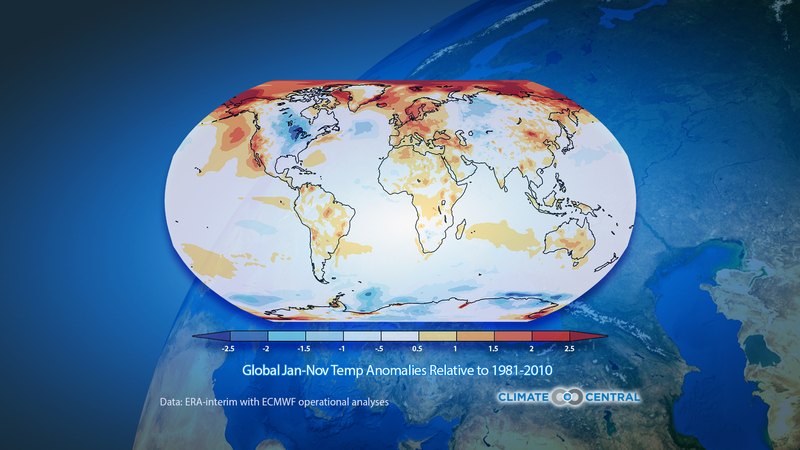 The analysis by van Oldenborgh concluded that global warming has made a temperature anomaly like the one observed in 2014 in Europe at least 80 times more likely. For many individual countries the probability has increased by at least a factor of 30 (e.g., the UK, many countries in Central Europe). Using a large computing network (weather@home), Oxford scientists simulated possible European weather based on the observed global ocean temperatures. 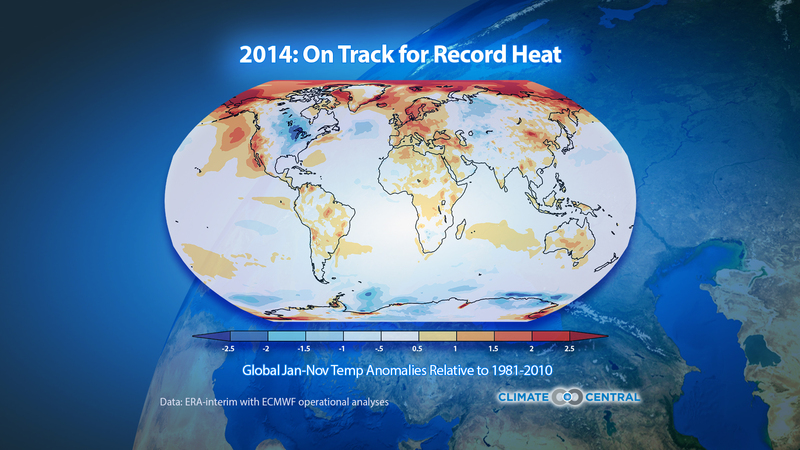 At the same time, they also simulated a 2014 where there is no human-influenced climate change. Comparing those two “worlds” they found that the 2014 European temperatures were much more likely in the world with climate change than the one without. 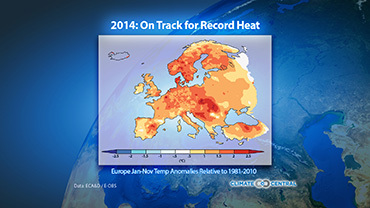 Nineteen European countries are very likely to see their hottest year on record: Austria, Belgium, Croatia, Czech Republic, Denmark, France, Germany, Hungary, Iceland, Italy, Luxembourg, The Netherlands, Norway, Poland, Serbia, Slovakia, Slovenia, Sweden (equal to 1953) and the United Kingdom.